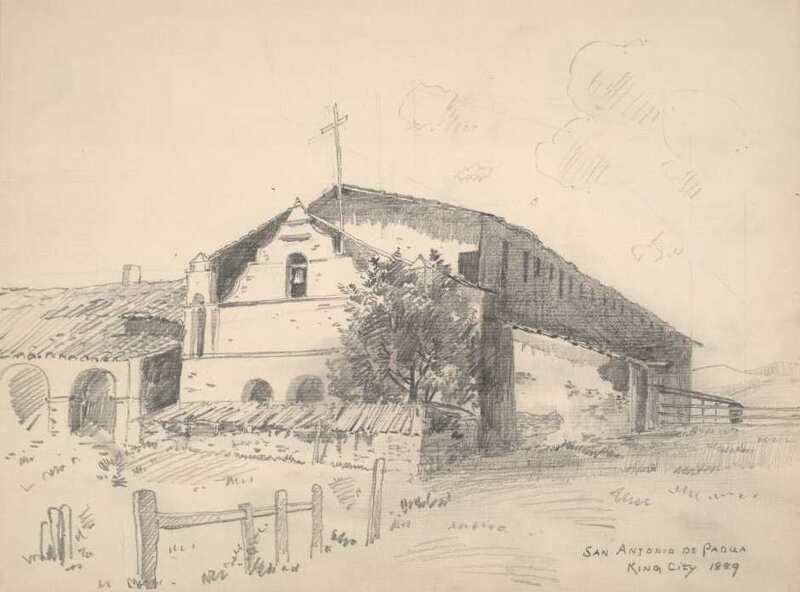 Here we present a gallery of paintings, photos and drawings that depict the Mission San Antonio timeline tracing its decline and restoration from the nineteenth century to the present. This page is a companion to the main page about the mission which can be found here. The Mission San Antonio timeline of course begins with its founding. It was the third mission established by Fr. Junipero Serra after those in San Diego and Carmel. Mexico achieves its independence from Spain. The drawing above is the earliest depiction of San Antonio Mission that I've been able to find. It is undated, but was drawn in 1850. The missions are "secularized". This meant that ownership and control was taken from Church authorities and placed in the hands of the government. The government then attempted to sell the buildings and acreage. This is the beginning of the long decline of the mission. 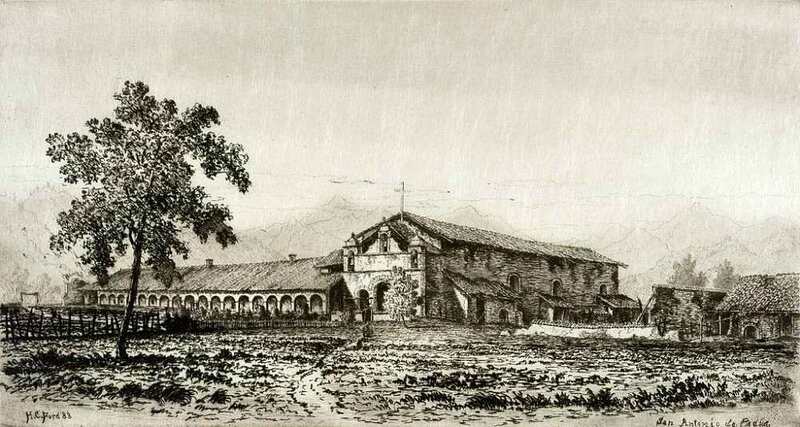 Mission San Antonio was not sold, but still remained under civil control of Mexico and the US until 1863 when the United States under President Lincoln returned the mission properties to the Catholic Church. 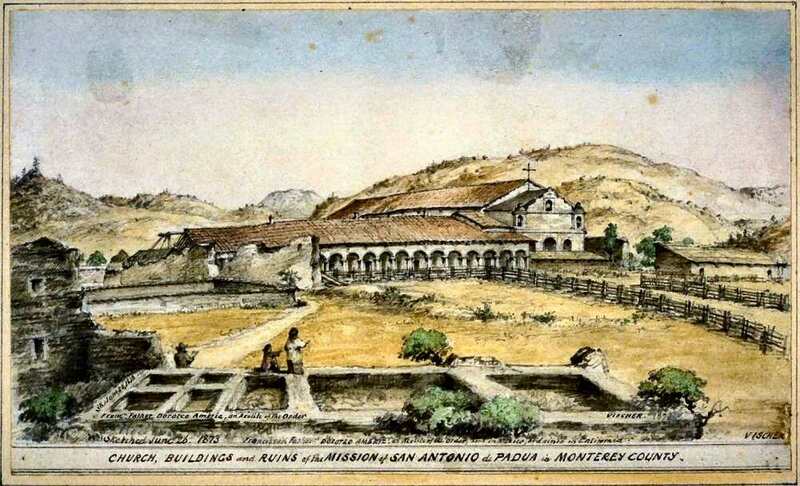 The dates on different sites vary, but the Mission's history page asserts 1851 when Franciscan Father Doroteo Ambriz (also spelled "Ambris") becomes the pastor of Mission San Antonio. Father Ambriz was the pastor at the time of Vischer's drawing below and is cited at the bottom. California was admitted to the Union as a state in 1850. 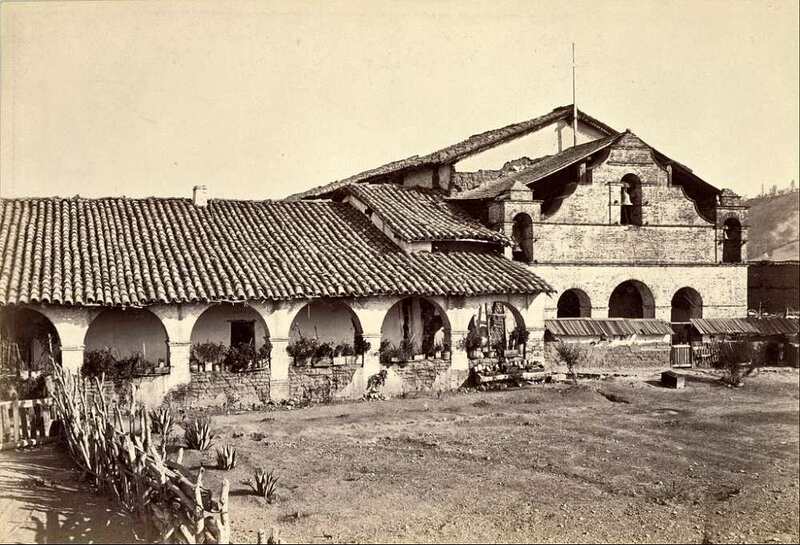 From the evidence, it seems that Father Ambriz was able to achieve a reasonable level of maintenance, at least of the church itself and the adjoining convento. 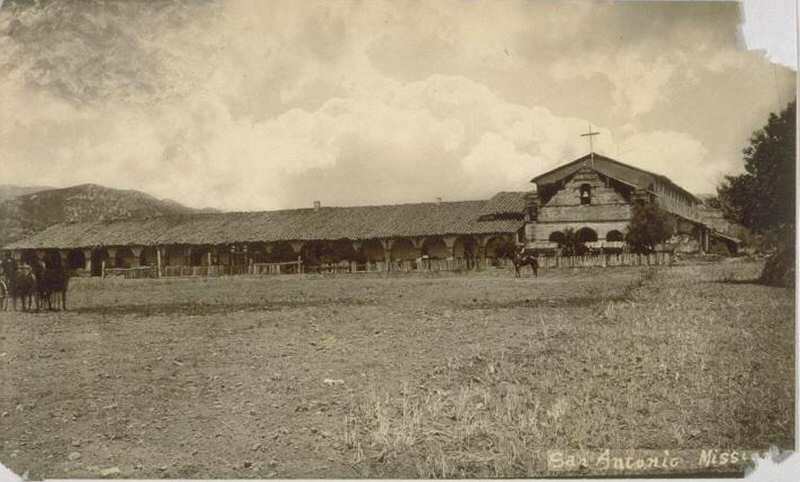 In 1893, Father Ambriz dies and is buried in the church sanctuary. The mission is essentially abandoned and suffers rapid decay after this. The above drawing is dated 1889. Six years after Father Ambriz' death. Not much decay showing, yet. An undated photo, around the same time as the drawing above it. Certainly prior to 1894 as we'll learn below. With the mission all but abandoned, it seemed fair game for salvage. 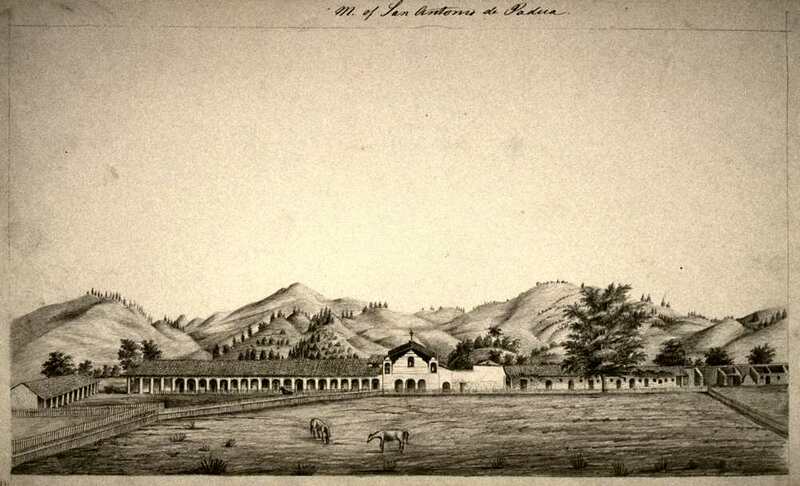 In 1894, the builders of the Southern Pacific RR depot in Burlingame (south of San Francisco) used this mission and the asistencia mission in San Mateo as a source of roof tiles. 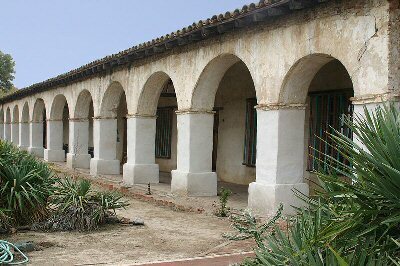 The depot was built in the newly popular "mission revival" style. In the Deakins painting above you can see gaps in the roof of the church (the tall structure) where tiles were removed. With the protection from the rain removed, the adobe then quickly deteriorates. 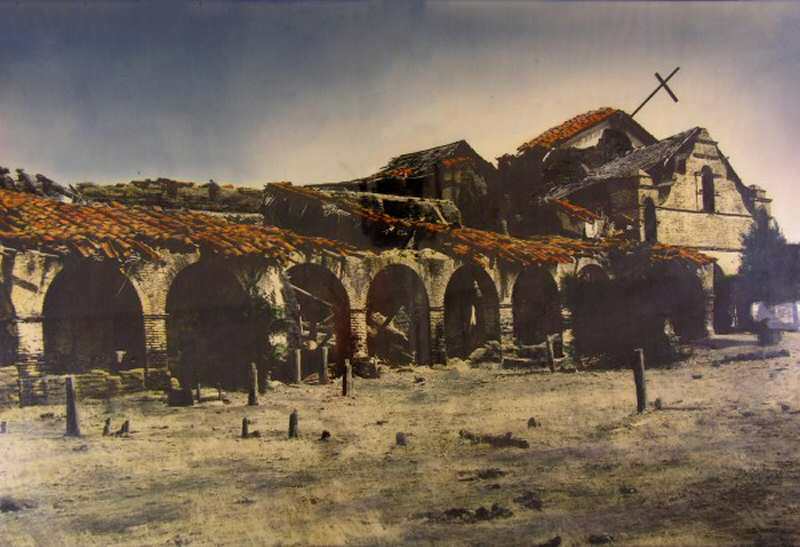 This photo, from 1903, show the rapid decay of the mission. Note the stacked roofing tiles in the lower right corner. They are either being sorted for salvage or in preparation for restoration. 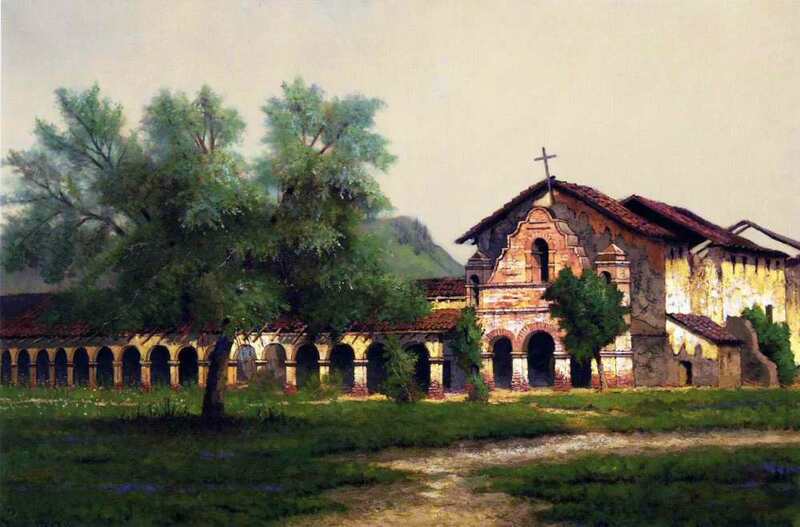 Fortunately, it was also in 1903 that a group, the California Historical Landmarks League, took note of the deplorable condition of the California missions and undertook efforts to repair or at least stabilize the decay. 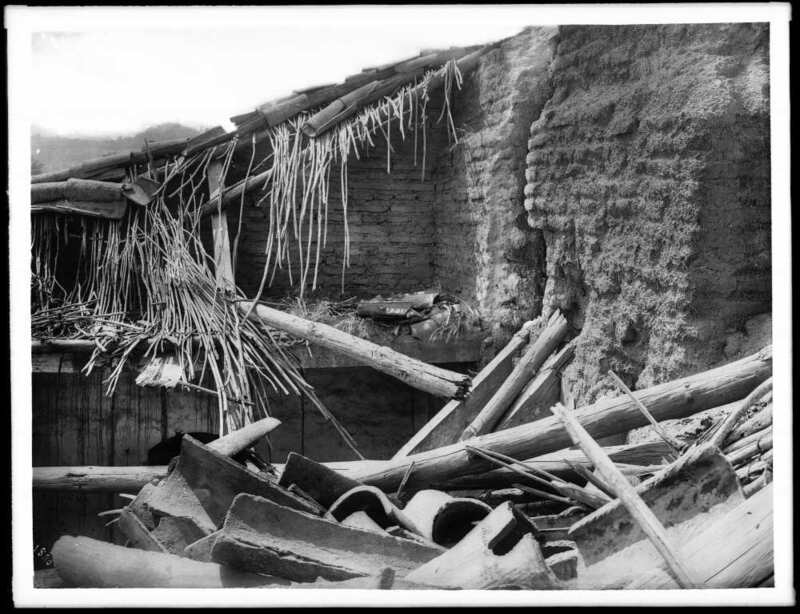 This 1904 photo above shows how quickly the adobe erodes when not protected. 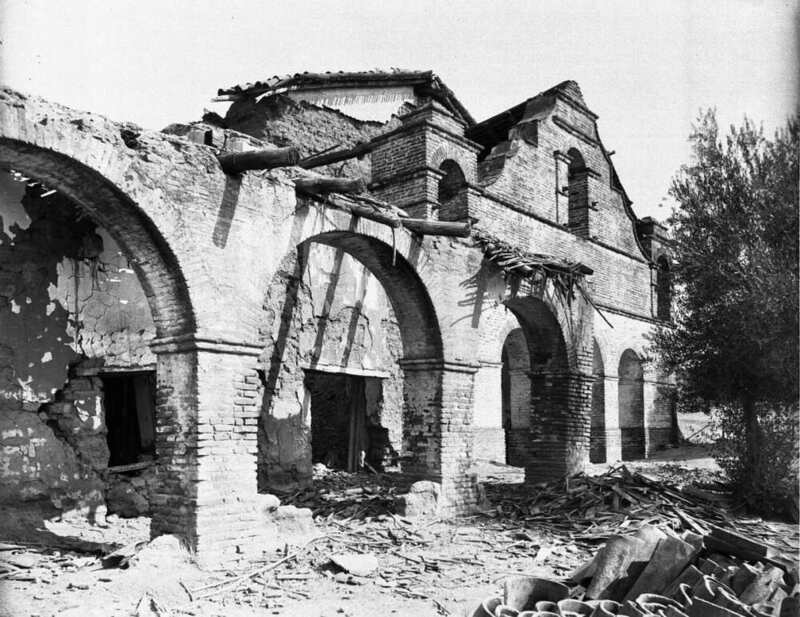 Some work was done, but efforts to repair the damage were interrupted by the damage done to the mission by the 1906 San Francisco earthquake. Mission San Antonio is approximately 140 miles south of San Francisco, but lies only 30 miles to the west of the San Andreas Fault. The color photo above is from the 1920's and shows that the restoration effort had stalled. 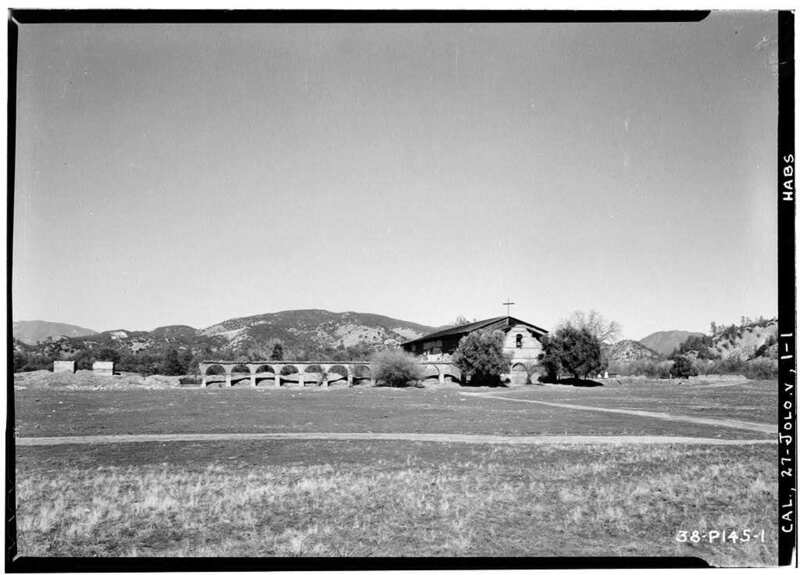 In 1928 the Franciscan order (of which Junipero Serra had been a member) were invited to return to take charge of the mission. This was 45 years since the death of Father Ambiz. That year, upon their return, the first mass since 1883 was celebrated in the mission. Restoration also became a more serious undertaking since it was now a home to those friars living there. A good roof is desirable even for a mendicant. The B&W photo above was taken in 1934 as part of the Historic American Buildings Survey that put out of work architects, draftsmen and photographers to task cataloging significant buildings around the country. The drawings from San Antonio appear on another page here. The church has a temporary roof on it and the convento to the left is reduced to the arches. The rubble appears to have been cleared away. This was the lowest point in the mission's history. 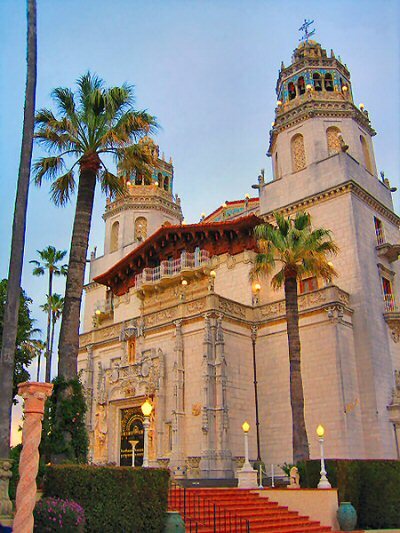 In the 1940's, William Randolph Hearst (of Hearst Castle fame) donated $50,000 to the renovation efforts which moved things along. By 1952 reconstruction was completed. A recent photo of the mission taken early one morning showing the reconstruction complete. However, the work needed to preserve Mission San Antonio is by no means done. 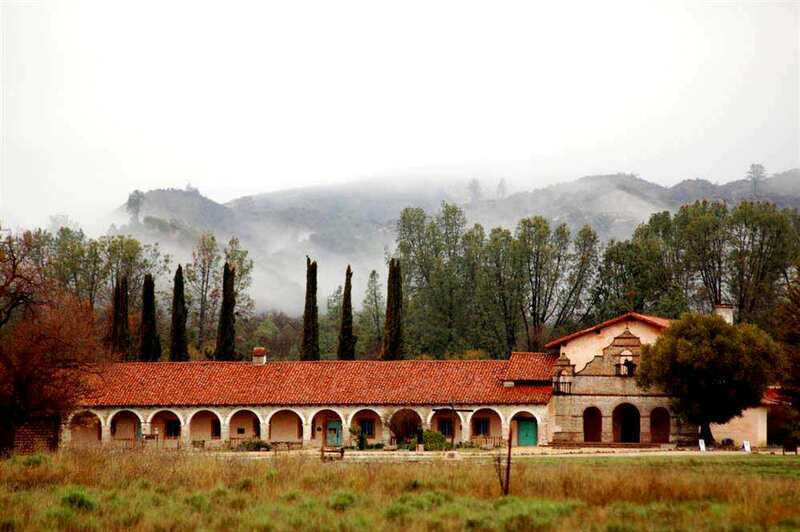 As shown by the damage that was done to nearby Mission San Miguel during the 2004 San Simeon earthquake, retrofitting is essential to keep the structures safe and intact during and after the inevitable earthquakes that occur in California. Additionally, the state of California is requiring this work be completed in the next few years. I recommend you visit the site of the Campaign for the Preservation of Mission San Antonio de Padua and see what the next phase of renovation looks like. 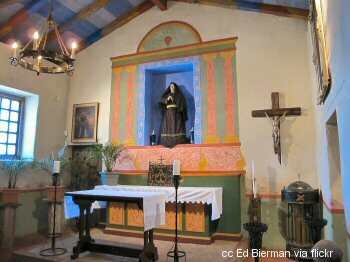 One final note: in 2005 the Franciscans again left the mission and the parish is now staffed by priests of the diocese of Monterey. Perhaps one day they will again return.